Constructed from 1957 to 1963, the Clearview Expressway (I-295) connects the Throgs Neck Bridge with the major east-west thoroughfares of Queens and Long Island. The Expressway was first proposed in the “Joint Study of Arterial Facilities” released by the Port of New York Authority and the Triborough Bridge and Tunnel Authority on January 16, 1955. The report called for a roadway on the Queens side of the Throgs Neck Bridge as well as several other major highway projects. Since the proposed Clearview Expressway provided an important commercial link between Long Island and I-95, Robert Moses (1888-1981), Commissioner of the Triborough Bridge and Tunnel Authority, was able to obtain 90% of the construction costs from federal funds under the Federal Highway Act of 1956. Original plans for the expressway called for a six-lane highway that would run south from the Throgs Neck Bridge to the soon-to-be-constructed Long Island Expressway (LIE), largely along the routes of Utopia Parkway and Francis Lewis Boulevard. In the original plans, southbound Clearview traffic would only have access to the eastbound LIE, and westbound LIE traffic would only have access to the northbound Clearview. South of the LIE, the Clearview was to follow the route of Francis Lewis Boulevard. However, the construction plans resulted in protest due to the population displacements the project would entail. The protests were effective, and a revised plan was agreed upon in 1956 that moved the expressway to the east, saving over 400 homes in the process. In 1957, after the residents of the homes along the revised route of the Expressway were moved to a new neighborhood built on the site of the Bayside and Oakland golf courses, construction on the Clearview Expressway began. Despite the fact that the roadway was not scheduled to open until 1965, the construction was expedited to improve transportation to the 1964 World’s Fair in Flushing Meadows-Corona Park. The portion of the expressway between the Throgs Neck Bridge and 73rd Avenue in Fresh Meadows, a section that included the LIE interchange, was completed in 1960. Three years later, the remainder of the expressway, including a four-level “stack” interchange with the Grand Central Parkway, was completed. A plan to extend the Clearview Expressway south through the communities of Hollis, St. Albans, and Springfield Gardens before connecting with the proposed Nassau and Bushwick Expressways, was officially terminated on March 24, 1971 by Governor Nelson Rockefeller due to community concerns and an overall lack of funding. Nevertheless, over 90,000 vehicles travel on the expressway’s 5.3 miles each day, making it a crucial connection between Long Island and the rest of the Northeast. Clearview’s Tail overlooks the Clearview Expressway’s terminus at Hillside Avenue from an elevation on Whitehall Terrace. The land was acquired for park purposes as part of a modification of the western line of the Clearview Expressway on October 4, 1965. 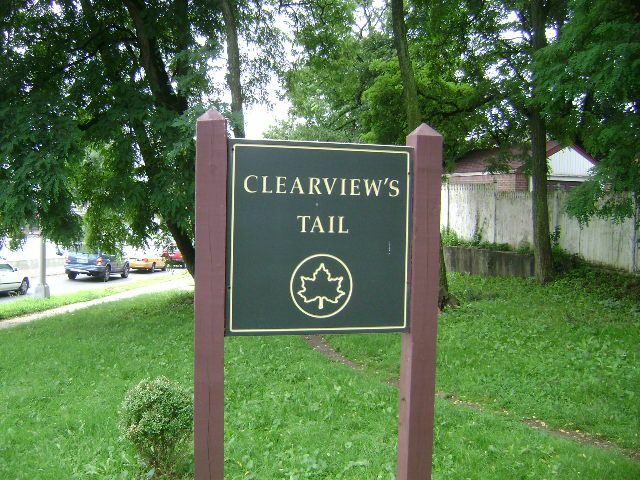 Clearview’s Tail contains plantings and trees that provide shade for passersby.